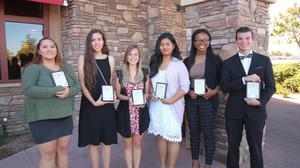 On September 13, 2018, students from Hemet Unified and San Jacinto Unified were recognized as Students of the Month at an awards breakfast held at the Sizzler Restaurant in Hemet. 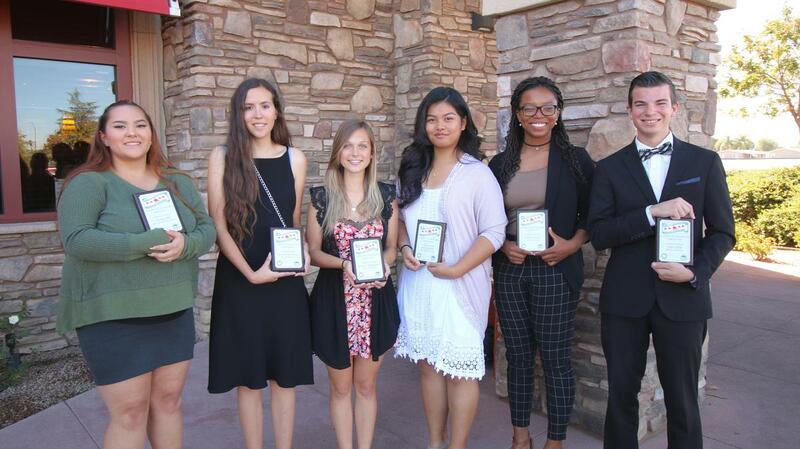 Students were selected from Hemet High School, West Valley High School, Tahquitz High School, Hamilton High School, Helen Hunt Jackson College Prep High School, San Jacinto High School, and Mountain View High School/Mountain Heights Academy. Sponsors of the Student of the Month Program donated backpacks filled with gifts, gift certificates, a plaque, Certificates of Recognition, and much more. The students had an opportunity to thank their families and teachers who have supported them and helped them plan their future life goals. Kirsten Pellegrino was selected as the Hamilton High School Student of the Month. Kirsten was nominated by her teacher Adam Bishop, for her ability to overcome diversity. Bishop said “I only know of some of the struggles that Kirsten has had to go through, but she still comes to school with a smile on her face everyday.” Kirsten is on the school’s cheer, soccer, softball and track teams. She plans on attending college after high school to pursue a career as a pediatric nurse so she can help others. Samantha Torres was chosen as Hemet High School’s Student of the Month. Samantha was nominated by her teacher James Walsh due to her perseverance and work ethic. She is currently a member of the school’s Mock Trial team, a Trig Star, Math League member, and an athlete in track. In her spare time she volunteers at Hemet Hospital and the Hemet Public Library. She hopes to attend University of California, Los Angeles to pursue a career as a physician or surgeon. Tahereh (Maddy) Moghadass was selected as Helen Hunt Jackson College Prep High School’s Student of the Month. She was nominated by multiple teachers for her responsible, hard-working and articulate nature. Maddy is currently ASB President, a Yearbook staffer, and community volunteer. After high school she plans on attending University of California, Los Angeles and becoming a Physician’s Assistant. Dylan Carter was selected as the Tahquitz High School Student of the Month. Dylan was selected for his determined attitude. His nominating teacher, Kacy Simpson said, “There are things that Dylan has had to experience in his life at such a young age that would break an older person. However, this young man has persevered and works harder than most.” Dylan is currently in the AVID Program, Club AVID Historian, member of the Key Club, and Senior Captain for Color Guard. He plans on attending a 4-year college and pursuing a career in healthcare. Jeverdy Barro was nominated as West Valley High School’s Student of the Month. Her teacher Mr. Dawson nominated her for her consistent excellence. She is currently ranked number one in her class academically at West Valley and is working to become the school’s Valedictorian. She considers herself a realist and works hard to ensure her goals are met. She plans on attending college to major in mathematics and possibly become a math teacher. Congratulations to all the students, teachers, principals, and family members. It was an inspiring morning celebrating these students and their bright futures.